Relax! Recharge! Rejuvenate! January in Jamaica! Where is the best place for fresh tropical food plus sun & fun in the winter? Visitors on cruise ships or staying gated resorts all miss authentic Jamaica. January in Jamaica offers coconuts, 7 waterfalls and fresh tropical foods. Stay by the sea, enjoy fresh tropical foods & experience Jamaican culture. Come to January in Jamaica to a special place south of Montego Bay. Reserve now for Chef John's 2014 retreat with yoga and tropical foods. 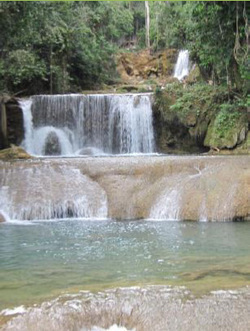 Relax, Rejuvenate in Jamaica, Swim in the ocean, Seven Waterfalls! Visit www.January-in-Jamaica.com for more information! Jamaica was a wonderful experience for me. The relaxed pace and tranquil surroundings were a delight. The raw food classes were very helpful and informative. Chef Adam kept finding things growing nearby, like chocolate! John was resourceful in finding folks who delivered food to us frequently - an organic farmer, the coconut man and so on. The ocean was gentle and delightful, the flowers and growing trees were amazing. We visited the organic farm with goats. It was quite a hike and the farmer has many big plans. We had a truly amazing trip to the 7 waterfalls with a picnic lunch. It was our one chance to buy some local products. I loved yoga by the sea and the cooking classes by the pool. I would highly recommend it to all who want to learn more about raw foods.